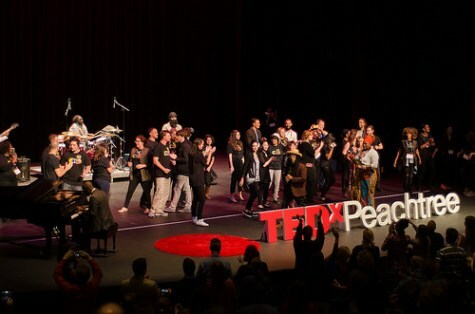 On the campus where some of the brightest and most innovative young minds in our country study, 16 of the most innovative and slightly older minds took the stage at TEDxPeachtree 2015. This year's "brain-spa" and presentation of ideas worth sharing took place at the Ferst Arts Center on the Georgia Tech campus in Atlanta, Georgia. The weather was beautiful, the house was sold out, and the audience was eager to take in all that the day had to offer. Ripple was the theme for this year's event and talks focused on how our actions create ripples through the people that we meet and the world that we live in. The first segment of the four-part day was aptly named "Spark." Speakers examined ideas and concepts that may seem small, but ignite very big things. Richard Wright explored the effect that our cashless society is having on criminals. By starving them of their cash fuel through the digitizing of money, crimes are leaving the street and resurfacing on your computer. One attendee commented, "That talk really made me think about the digital divide and how that barrier has cut out those who aren't tech savvy or have access to technology even when it comes to crime." From TED Youth 2014, the audience heard Kenneth Shinozuka's story of his childhood invention, Sensor Socks. By wiring socks with tiny sensors to alert family members that his grandfather was wondering off, he developed a solution to the dilemma facing many with loved ones living with dementia and Alzheimer's. Jenay Beer also discussed making technology work for seniors in our communities. Her work with computers, robots and the elderly has led her to always factor in humans in her engineering. "Oftentimes what is good technology design for the elderly, is good design for everyone: large fonts and simple design." Brian Magerko looked at creating sparks that can fuel an interest in coding. His Ear Sketch program, which is used by tens of thousands of people, makes the connection between musical expression and computer programming. It has proven crucial in developing interest in careers in technology in underrepresented populations across the country. Perhaps the brightest spark of the first session was Chris McCord. His story of how his life, that was filled with anger and failure, turned around following a challenge from one person was compelling and inspiring. Through a combination of humor, truth, and dance the audience learned that the simple act of mentoring creates great heroes. Finishing out the first half of the day was the "Shift" segment. This group of talks focused on the need for us to look at the effects of the things that we do in a different light. Kirk Bowman urged the crowd to identify, inspire, and invest in existing nonprofits. The trend of starting new charities has led to startup burnout in targeted communities and numerous struggling and failed organizations. Bowman urges us to fan the fragile flames of programs that already do work through manpower or financial support. Instead of making our own ripple, look at current ones that we can put our energy towards. Poet M. Ayodele Heath shared the "Genealogy of the Byrd Family." This poem told the colorful and ever -winding tale of possible truths about the history of a family's last name in a style that could best be called "Alex Haley's Roots on a shoestring budget." In his travels studying aquatic life, Alistair Dove has seen the effect of our non-recycling ways on shorelines and in oceans around the world. His images of plastic trash on beaches in the Galapagos were a shocking visualization of where our garbage can end up. His call to action was for us all to cut down on plastic. The ripple effect of having a positive mindset was explored by Glenn "Daddy-o" Bolton and Jennice Vilhauer. Bolton has learned that while working with your competition, " Watching is learning. Hating is dumb." By finding a space that is not there yet you create new opportunities to grow as an artist. Vilhauer was much lauded for her theory that positive thinking leads to positive outcomes. She has found that it is your expectations of your future that limit you the most. Following lunch, the highly energizing "Disrupt" program began with a bang! HeaveN Beatbox returned again this year for a stunning performance with the Atlanta Celli. The stage was electrified by their combination of classical instruments and hip-hop vocalization. The performance earned cheers and a standing ovation from the crowd. Jordan Amadio came to the stage and shared how he has made the startup model work in the world of neurosurgery. His program NeuroLaunch is the world's first neuroscience startup accelerator that has graduated 11 startups that have created $15 million in value. In keeping with the "brain" theme, the crowd was riveted by Miguel Nicolelis' TED Global 2014 talk on brain-to-brain communication. Through the use of mental imaging, scientists have made it possible for brains to be able to share their abilities with other brains. One TEDxPeachtree attendee noted, "I wish Dr. Nicolelis was here in person. I have questions on top of questions about the possibilities of that technology." The finale of the "Disrupt" portion of the program was Roboticist Andrea Thomaz. Thomaz wowed the audience with a robot named Curi. The robot, which has the ability to take social cues from humans, is a major step towards actually having the Jetson's "Rosie" in our very own kitchens. "Connect" was the final segment of the day, and it fittingly began with Movement Explorer Galo Alfredo Naranjo. He has found the correlation between movement and the energizing effect it has on the mind. "The opposite of play isn't work; it's depression." The effect that physical movement had on the human body isn't just one of increased heart rate and the possibility of weight loss. As Galo Alfredo Naranjo tells it, movement of the body makes for movement of the mind also. The topic of social networks and how willing we are to take advice from our friends and family was the focus of Jill Perry-Smith's talk. Her research has shown that people are more likely to take advice from perspectives that are different from their own. Because of this, the probability of us acting upon advice from people not in our immediate circle of friends is higher. One audience member commented, "Unleash your creativity by keeping your friends close and your acquaintances closer!" The winner of this year's TEDxPeachtree Poetry Slam Theresa Davis wowed the audience a performance of the heartwarming poem that captured that title. Her piece "Like Like" struck a chord with many in the crowd with its look at young love and how vernacular transcends age. TEDxPeachtree 2015 ended with laughs and music. Sophie Scott's Vancouver TED 2015 talk "Why We Laugh," had the crowd in stitches while cultural activist Eric Dozier took the audience on a journey of song and discussion of music as a social force. That theme was punctuated with Grammy Award winning Arrested Development taking the stage for a rousing performance. With members of the TEDxPeachtree staff joining the band onstage and the audience rising to their feet it was a spectacular ending to an awe-inspiring day. 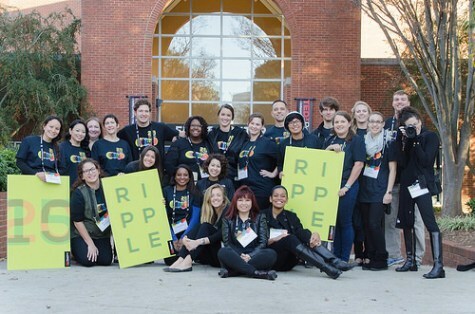 Were you inspired to be a ripple from the talent at TEDxPeachtree 2015? Join in the conversation and share your thoughts on Facebook and Twitter. View photos from the event on Flickr. Maria Pinkelton is a writer and communications strategist. She lives in Decatur with her husband and son, along with a fine collection of books, craft beers and size 11 shoes.